The second colored field of the year by Shaw Sports Turf and Medallion Athletics is a gray field at Pine Lake Prep. The first colored field was the teal at Coastal Carolina. The brand-new unique gray and navy Shaw Sports Turf field at Pine Lake Prep. It is our first field to call our home and it will make the students feel special playing on a Shaw Sports Turf field like NFL and college teams. 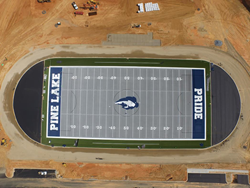 Pine Lake Preparatory finally has their very own home field to practice and play games on. Shaw Sports Turf was the manufacturer and provider of the unique gray and navy synthetic turf field. Medallion Athletics of Mooresville has handled the installation of the field. Pine Lake Preparatory is a K-12 public charter school that was established in 2006. The current enrollment exceeds 1,700 students. In the 2012-2013 school year the high school teams captured six conference championships, participated in five different NCHSAA state playoffs and won their first-ever individual swimming and tennis State Championships. The middle school teams followed suit and assured Pine Lake a bright future; earning the right to play in eight conference championships and winning five. The athletic teams have not had their own field to practice and play on since the establishment of the school. High school and middle school football, boys and girls soccer, and potentially lacrosse in the future will be utilizing the first-ever Shaw Sports Turf home field for Pine Lake. Shaw Sports Turf was selected as the manufacturer of the gray and navy field because of Medallion Athletics’ confidence in Shaw Sports Turf’s ability to provide Pine Lake with exactly what they were wanting. The Pine Lake gray field is the second unique-colored field that Medallion has partnered with Shaw Sports Turf this year. The first of which was the bright teal turf field in the TD Sports Complex at Coastal Carolina University. The home for Chanticleer football and women’s lacrosse amidst the TD Sports Complex has a new and unique-looking Shaw Sports Turf playing surface featuring the first “Teal Green Turf” field in the nation. The community and students are thrilled about their first-ever and brand new Shaw Sports Turf unique gray and navy field. The parents of Pine Lake students gave graciously to fund the project, showing their commitment to the school and students. The first game to be played on the Shaw Sports Turf field will be on September 4th. A wholly-owned subsidiary of Berkshire Hathaway Inc., Shaw Industries is a full flooring provider to the residential and commercial markets. Shaw supplies carpet, hardwood, laminate, resilient, and tile/ stone flooring products, as well as synthetic turf. Shaw Sports Turf is one of the leading synthetic turf companies in North America and has represented quality and innovation for more than two decades with over 1,500 successful installations, including an impressive list of high-profile field installations. For more information please visit http://www.shawsportsturf.com, call 866-703-4004 or find us on Facebook.